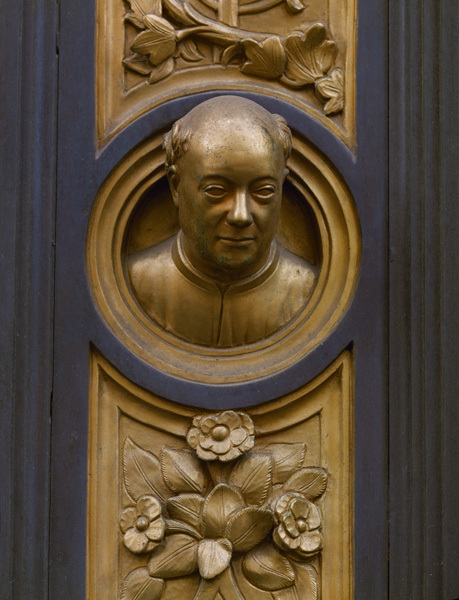 Ghiberti was a goldsmith, sculptor, and architect as well as the author of a commentary on art and artists. In that text he included his own biography, the first artist’s autobiography of the Renaissance. 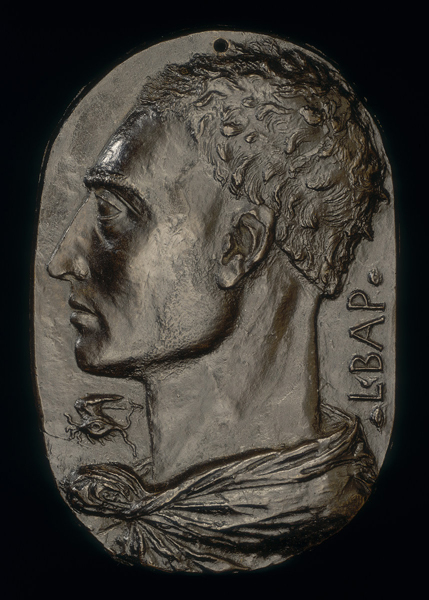 Victor in the competition to design the reliefs for the bronze doors of Florence’s baptistery, he incorporated this self-portrait in a framing panel. Both portrait and biography are testimony to the increasing status of artists. Alberti was among the most talented and multifaceted of all “Renaissance men.” He produced extremely influential treatises, not only on painting but also on sculpture and architecture as well as family life. He knew law, philosophy, and the classics—he wrote a Latin comedy—and was interested in subjects ranging from ancient ships to cryptography. He worked as an architect and sculptor and he made this self-portrait. His emblem, the winged eye that appears at the lower left, refers to the all-seeing eye of God. Alberti described the eye as the swiftest, most powerful, and worthy part of the human body. Links between the visual and liberal arts were nothing new: such links had been made since antiquity (see Competing for Status 1). Renaissance theorists who used comparisons to philosophy or poetry as a way to elevate art were following the arguments, sometimes the very words, of ancient authors such as Pliny, Lucian, and Cicero. In that sense, humanism was essential to the intellectual climate that made the rise in artists’ status possible. That does not mean, however, that artists were generally able to attain the degree of learning acquired by poets or philosophers (most, remember, stopped formal schooling as young boys). Instead, artists—and their patrons—often relied on humanists such as Equicola (quoted earlier) to outline mise-en-scènes for themes taken from classical myths or ancient history. The humanists suggested suitable subjects, coordinated iconography, and supplied details of character, setting, and action. Although some artists, including Mantegna, Michelangelo, and Raphael, undertook classical studies, few had more than rudimentary knowledge of Latin, much less Greek. 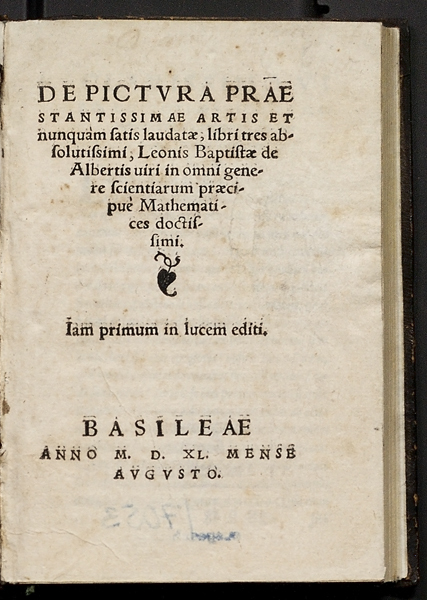 Alberti—a humanist who said he practiced art for pleasure—published his treatise on painting in Latin and Italian editions. The Italian language had begun to command increased prestige; this fact probably helped the standing of artists, who were now able to argue their own case and take a place among other men of letters. Several artists gained status by virtue of their expertise in ancient art, which they acquired through study (and sometimes restoration) of classical sculpture and architecture. Their knowledge made them valuable advisers to humanist collectors and connoisseurs. Raphael, for example, oversaw the pope’s collection of antiquities; when Raphael died, the pope granted the artist’s request to be buried in the Pantheon, the most celebrated of Rome’s ancient temples. A few artists were raised to the nobility and thus separated from control by the guilds; in fact, men of aristocratic status were prohibited from guild membership. Gentile Bellini was made a count by the emperor Frederick III; Mantegna was given the same title by pope Innocent VIII, and Titian by the emperor Charles V. The emperor himself was said to have stooped to pick up a brush dropped by Titian. The honor accorded Sebastiano del Piombo is evidenced in his nickname (piombo means lead), which alludes to the lead seal that was in his charge as Keeper of the Seal, a high church post. It was even rumored, falsely, that Raphael was to be made a cardinal. Later in the sixteenth century, a number of artists, Bandinelli and Vasari among them, were knighted. As the century progressed, more artists came from families of fairly high status, including Paris Bordone (whose mother was a noblewoman), Agnolo Bronzino, Benvenuto Cellini, and others. And, as noted above, the privileged background of Sofonisba Anguissola allowed her to study art as a gentlewoman’s virtue in the first place and then to fit in with the courts and elite households where she was employed. Literary works such as Baldassare Castiglione’s The Book of the Courtier (see “The courtier and the arts: An excerpt from Baldassare Castiglione, The Courtier”), published in 1528 but begun twenty years earlier, encouraged the sons of rich men to learn to draw and appreciate art as part of being gentlemen. Artists’ presence and active participation in the life of influential courts was another factor in their increased social standing.